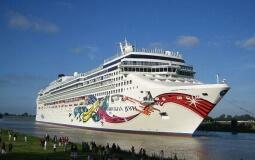 [Norwegian Jewel] 50% Off Second Guest: Japan Golden Week - Limited time of great deals and discount! (1) Promotional fare is not applicable to cabin category "Inside" and "Sail Away" (category "X"). (3) Fare price excludes an onboard gratuity of USD 14.50 ~ 17.50 per person per night.